General Hospital spoilers tease that Spencer Cassadine (Nicolas Bechtel) once again will try to take down his great-uncle Valentin Cassadine (James Patrick Stuart), this time by trying to play private eye and somehow finding out that there is something suspicious about Nina Reeves’ (Michelle Stafford) daughter Sasha Gilmore (Sofia Mattsson) and wanted to know exactly what Valentin and Sasha had going on together! On Friday, April 12th’s episode, Valentin reminded him when confronted by Spencer that his daughter Charlotte Cassadine (Scarlett Fernandez) knew all about Spencer’s election tampering when he hacked into the polling place’s computers to help his grandmother, Mayor Laura Webber (Genie Francis) win the mayoral race! General Hospital viewers should find it interesting as Spencer continues to grow up and mature, he’s already showing some of his Cassadine genes as he tries to take down Valentin, but Valentin is older, wiser – uh – maybe not wiser – let’s say much more experienced – in the Cassadine family leverage procedures! So far Spencer may be catching up to Valentin in height, but not quite yet in sneakiness or leveraging! Spencer, very much his great-uncle’s great-nephew, tried to bluff Valentin by accusing Valentin of bluffing him! However, Spencer will continue to try to find something on Valentin so that he can get the Cassadine inheritance, that’s the whole reason he wants to take him down; he wants to knock him off his throne, so to speak, and somehow eliminate his competition, although Spencer would try to find some fraud on Valentin’s part or something like that. Spencer’s not quite evil enough to have his uncle Sonny Corinthos (Maurice Benard) put a hit out on Valentin – yet! If Valentin goes by the Cassadine Family tradition, which means only males can inherit, unless he has a secret son somewhere already, he would have no choice but to leave the inheritance to Spencer anyway; unless he breaks with Mikkos Cassadine’s (John Colicos) original tradition and changes things to leave it to Charlotte. 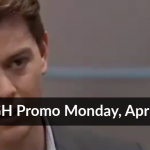 However, it looks like this time Spencer’s plans could really backfire in his face if he keeps up the threats about Valentin and Sasha having some kind of a scam and him telling about it – which he will, to Nina herself according to GH previews for Monday, April 15th’s episode. He’ll tell her that her knight in shining armor is blackmailing him, although the previews don’t show if he tells her anything of his suspicions about he and Sasha scamming her! If he does, Nina will shut that down real quick and that might be how his plan backfires; on the other hand, also shown in the previews is Valentin asking Nora Buchanan (Hillary B. Smith) for her assistance! Will Valentin really try to have Spencer prosecuted for voter fraud? That might not be down Nora’s alley of expertise, although she could surely steer him in the right direction – the right to DA Margaux Dawson (Elizabeth Hendrickson)! Valentin warned Spencer that juvenile procedures may not apply for a federal crime like voting fraud, although they may. That might be what he wants to ask Nora about, although it could be something else; you never know with Valentin! Stay tuned to GH and keep checking General Hospital spoilers frequently for all the latest news, developments and updates!